There are a couple of interesting bits in this excerpt from Hone’s Every-Day Book. 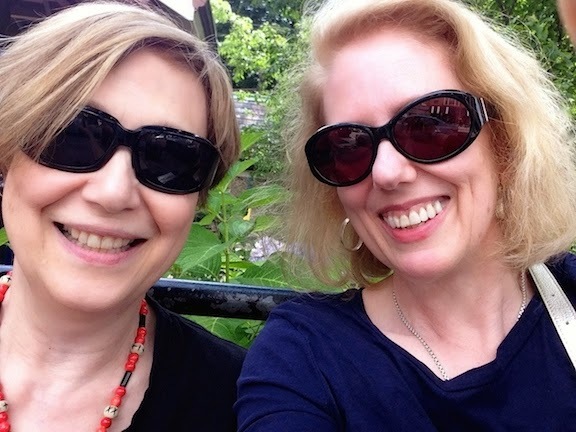 The first part reminds us that ordinary Londoners didn’t have anything like the access we do to music. If you were well off, you could go to the opera, ballet, or theater, or you would dance at Almack’s to some of the latest pieces from abroad. For ordinary people, London had its street musicians, true, as well as cheaper theatrical entertainments. 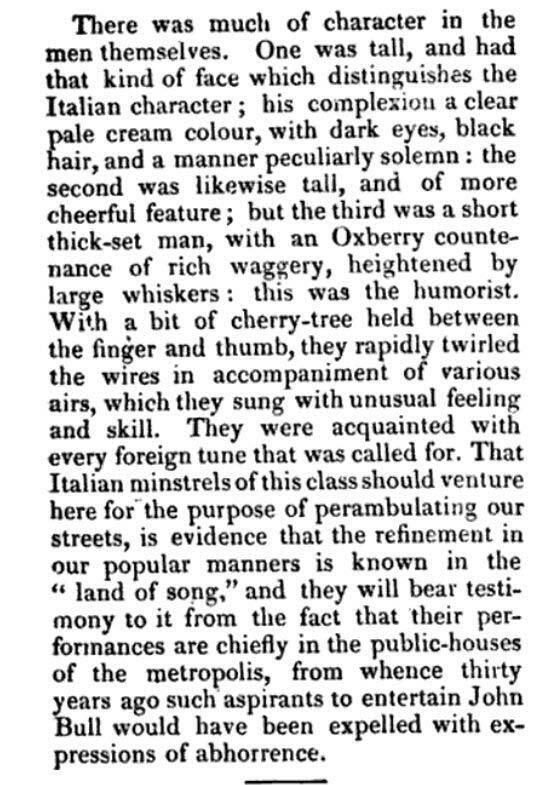 Italian music by Italian musicians, however, seems to have been rather uncommon in the 1820s. The second item I’d call to your attention is Hone’s reference, a little further on, to Londoners’ attitude toward Italian musicians a generation earlier, which this Rowlandson image illustrates. 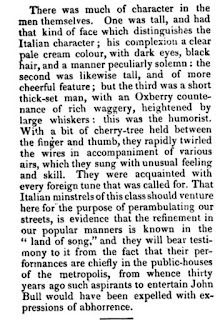 It is a far cry from the gentler and appreciative tone of Hone's report. 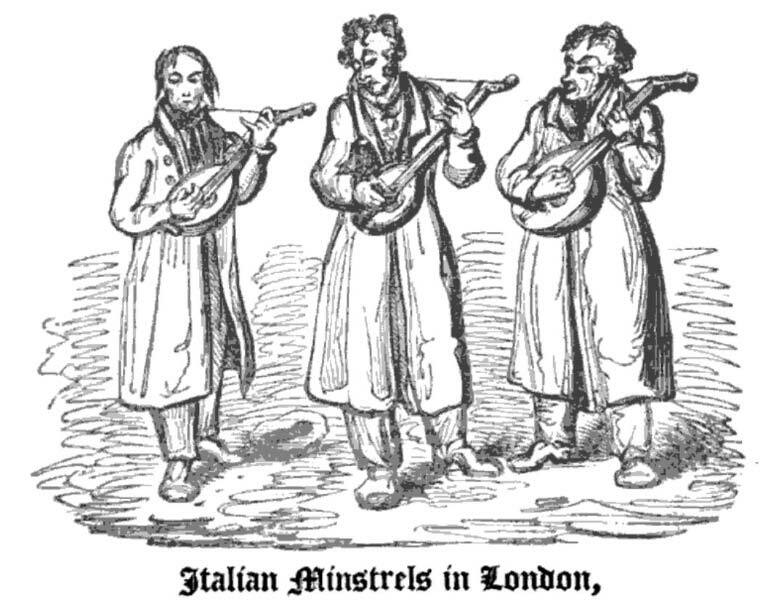 "Previous to Christmas 1825, a trio of foreign minstrels appeared in London, ushering in the season with melody from instruments seldom performed on in the streets. These were Genoese with their guitars. 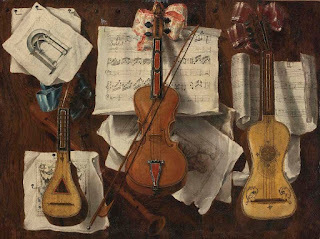 Musicians of this order are common in Naples and all over Italy; at the carnival time they are fully employed, and at other periods are hired to assist in those serenades whereof English ladies hear nothing, unless they travel, save by the reports of those who publish accounts of their adventures. 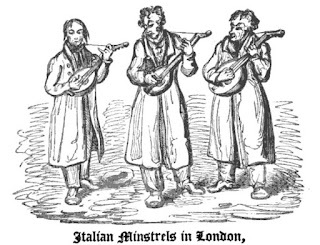 The three now spoken of took up their abode in London, at the King’s head public-house, in Leather-lane, from whence ever and anon, to wit, daily they sallied forth to ‘discourse most excellent music.’ They are represented in the engraving below, from a sketch hastily taken by a gentleman who was of a dinner party, by whom they were called into the house of a street in the suburbs. Their wild guitars and voices clear." Clicking on the image will enlarge it. Clicking on a caption link will take you to the source, where you can learn more and enlarge images as needed. Rich waggery. I love it!